Colombia’s migration authority said Monday it would expel 15 Venezuelan citizens who had taken parts in riots that broke out inside a refugee camp in the capital Bogota on Monday. The violence broke out “El Camino,” a tent camp set up for homeless Venezuelans a week ago in an attempt to help citizens from Colombia’s neighbor to the east that is suffering a major economic and political crisis. According to newspaper El Tiempo, the unrest broke out over food shortages. British newspaper The Guardian reported earlier this week about the poor services and lack of food in the camp. Video footage shared online by neighbors showed how camp residents looted a tent where food supplies reportedly were stored. There has been a situation of violence, but because of the lack of food. I told the camp administrators that this could trigger a situation of unnecessary violence. 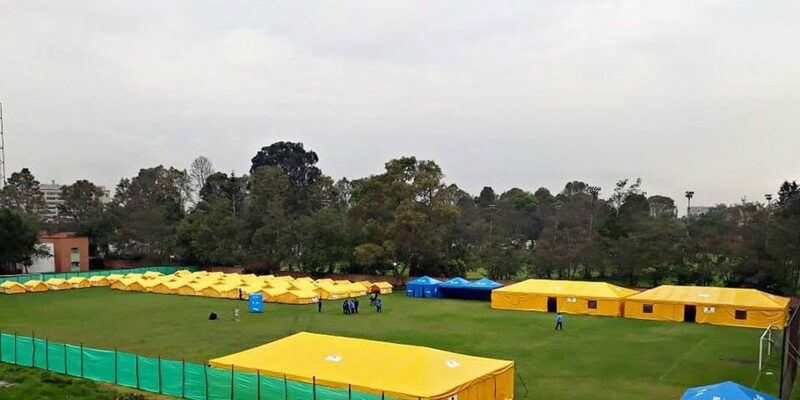 Local authorities denied the reportedly inhumane conditions and lack of humanitarian attention for the refugees and insisted that Bogota “will continue to be a city of open doors,” while announcing increased video surveillance of activities inside the camp. There was damage to tents, toilets, cameras and infrastructure that the city had set up for these people. We will continue to be a city of open doors to migration and we will enforce the rules. The camp will continue with strict surveillance and control. Several original camp residents decided to leave the camp before the violence broke out already while others are considering to do the same, according to El Tiempo. “I have to think of my daughter. We’re killing ourselves and that’s not right… It’s a disaster and there’s fighting over everything,” an anonymous Venezuelan women told the newspaper, adding that she would travel to Cali in the hope to find better living conditions.